Last week, I was supposed to attend the media launch of Anne Curtis and UNICEF's latest project - Heroes for Children Run but I was down with flu (boo!) so I was not able to attend. Anyway, this cause is too close to my heart so I wanna make sure that I help spread the word. You see, as a mother, children are very close to my heart. Every time I'd see a baby or a little child, I always think of Skye. It really breaks my heart to see young children in pain or abandoned or abused. So I really try my best to do my part and help in even the littlest way possible. So here I am, inviting each and everyone of you to run with Anne (and us!) and let us all be heroes for children. UNICEF Celebrity Advocate for Children Anne Curtis launches the ‘Heroes for Children Run’ for the benefit of children most in need, especially in their first 1,000 days of life. 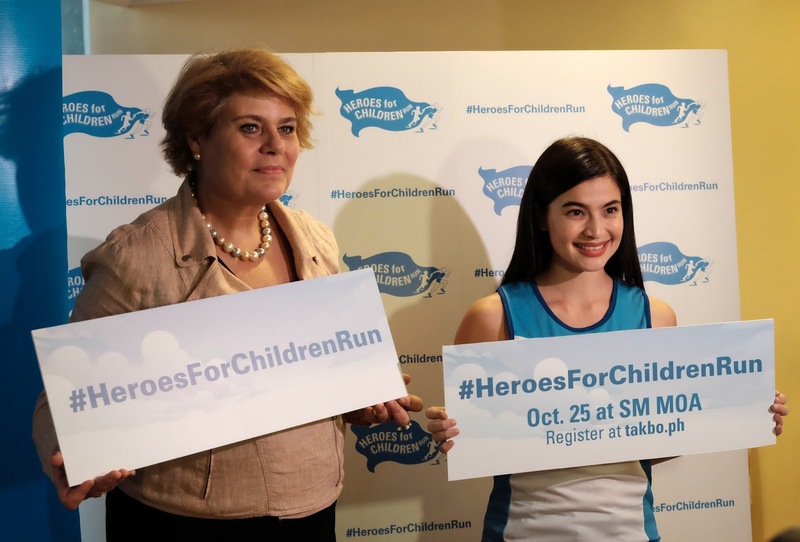 The run, slated for 25 October 2015 Sunday, at the SM Mall of Asia grounds, is the first major fundraising initiative by Anne Curtis since UNICEF appointed her as Celebrity Advocate last March. “I am very much invested in health and fitness. I thought a benefit run that demonstrates health and wellness is a great way to raise resources to support children to have the best start in life! Proceeds from the run will help fund UNICEF’s ‘1,000 Days of Life’ campaign,” said Curtis. UNICEF and partners launched the ‘1,000 Days’ campaign through a series of legislative advocacy forums with the House of Representatives and the Senate last July. The central theme is, ‘Ensuring the Right Start to Life through Optimal Maternal and Child Nutrition: Building a Stronger Nation’. “In the Philippines, at least 3.4 million Filipino children are stunted. Undernutrition accounts for over half of the 95 daily under-five child deaths. The ‘1,000 Days’ campaign will focus on much needed health and nutrition support in the critical first thousand days of the life of a child: from conception through pregnancy, to childbirth, and through to the child’s second year and beyond,” said UNICEF Country Representative Lotta Sylwander. The run will feature a 500-metre dash for kids (age 12 and below); 5k, 10K, and 21K. Online registration for the Heroes for Children Run is open at www.takbo.ph/heroesforchildren until 11 October 2015. In-store registration will run from 23 September to 21 October 2015 at the following Chris Sports outlets: SM Mall of Asia, SM Megamall, SM City North Edsa, SM City BF Paranaque, Glorietta, and Market! Market! Organised through running partners Leadpack and Takbo.ph, the Heroes for Children Run is presented through the support of SM Mall of Asia, PSBank, Double Dragon Properties Corporation, Enervon, SM Accessories, Belo Essentials, Cherry Mobile, Jack ‘n Jill, Toy Kingdom, SM Cares, Philippine Star, Nyxsys Philippines Inc., Chris Sports and Discovery Suites. To know more about the run and UNICEF’s programmes, visit www.unicef.ph or call 758-1000 (Mondays to Friday, 9:00 a.m. to 6:00 p.m.).